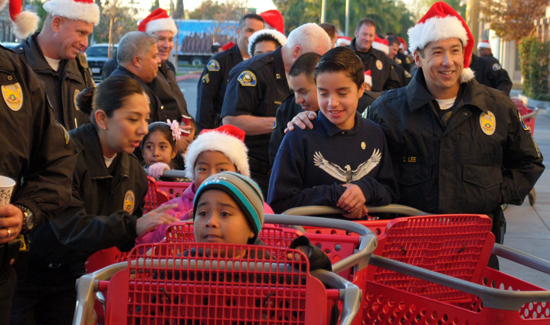 During Tuesday night’s annual Cops and Kids Christmas-time shopping trip, 10-year-old Michael was looking for something specific. He and his shopping buddies, Henderson Police Officers Stu O’Nan and Josh Greener hunted through the boys department at Walmart until they found what the young man was looking for — a dress shirt, tie and slacks. He said after getting to shop with his new friends in the police department, Michael said he feels a little different about Christmas this year than in the years past. But this year, Michael said, he is getting what he wants thanks to the Cops and Kids program. The Fraternal Order of Police Lodge No. 9 in Henderson sponsors the annual event which is designed to take children whose families are experiencing financial difficulties and provide them with a shopping trip in which they get warm clothing for the winter. Officer Greener, who accompanied Michael, Erin and Officer O’Nan, was both watching and shopping as he admitted to being a novice Cops and Kids participant. Henderson Police Chief Chip Stauffer said he was thrilled to see so many of the younger officers participating in this year’s Cops and Kids.